Turning off the ctrl+u function on the blog is one step to secure bloggers from the theft of script code on your blog and can also avoid theft of articles or content on your blogspot. This is indeed not fully able to secure or avoid copying articles by others, but by deactivating ctrl + u on the blog at least it will minimize the articles and your blog script code being stolen or taken by other people. of course your article or post cannot be copied by anyone other, but unfortunately this method is still not perfect and can still be used using ctrl + c, but I have also prepared another way, namely by turning off the text selection function on the blog. By deactivating the text selection function in a blog, of course your article or post will not be able to be selected, so it will be very difficult to copy or copy paste by others. Installing the anti ctrl + u script on the blog is also a step that you need to apply to your blog to secure and avoid theft of articles and blog script codes. You can use the redirect effect of the anti ctrl + u script to give a warning to people who are trying to see your blog code, so please create a special page on your blog to give a warning. 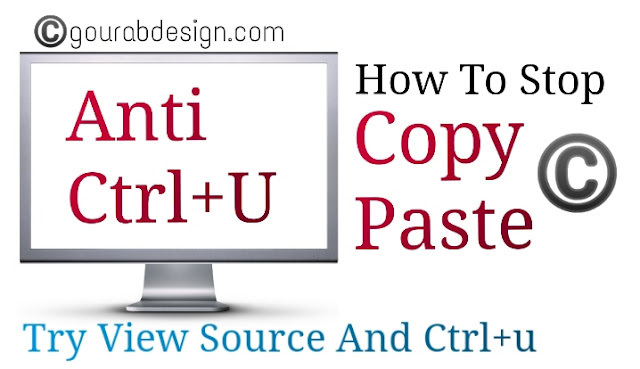 Either we just go to the main discussion about how to install the anti ctrl + u script on the blog with the redirect effect (redirected), for the tutorial please follow the steps below. 3. Look for the code </body> usually at the bottom. 5. Then click save theme . So friends I hope you have liked this article. So, share it in social media. So that everyone can get help. not working, also if you have implemented this function in your site because I can see your codes.